Okay, a poet I am not. I guess I'll keep my day job. 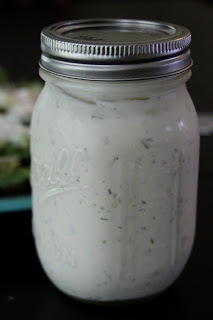 We go through so many salads and miscellaneous other veggie dipping experiences that Ranch Dressing is a hot commodity around here. I love the stuff. But I have to say, I don't love it out of a bottle. I found that Marie's brand dressing (found, refrigerated, in the produce department) is pretty dang close to fresh ranch. Except it's pretty pricey. And still not perfect. The good news, though, is that ranch dressing is super easy to throw together, and it's pretty much all ingredients you probably have already. I wish I could remember where I got this recipe, so I could give props to the creator. Mince the garlic with a knife, and then sprinkle about 1/8 to 1/4 teaspoon salt on it and mash it into a paste with a fork. Chop the parsley, and chives very finely and add to the garlic. In a bowl, combine all ingredients, tasting frequently and adjusting seasonings as needed. Chill for a couple of hours before serving, and thin with buttermilk if desired. I usually leave it thick if it is going to be for dipping, and I thin it before I pour it over a salad.